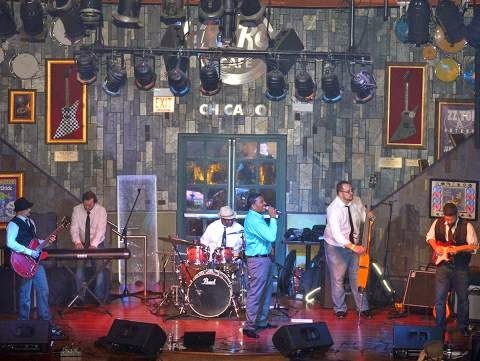 On its new EP, "Barely Gettin' By," Chicago blues band Po'Boy Special shows off the boundless energy that it creates on stage. Po'Boy Special will open for Ethan Butler on Dec. 26 at Metro, 3730 N. Clark St., Chicago. Captain Coopersmith, Bluefish Fellows and The Casual Ties also are on the bill. The show starts at 8:15 p.m. and tickets are $12 in advance, $15 at the door, available at Metro's website at www.metrochicago.com. I had the chance to talk to guitarist Anthony Barraco about the upcoming show. Q - Great talking to you. The band has gone through several incarnations in the last year. How do you think the band's name reflects your current sound? Are you happy with how the band has evolved? I couldn't be happier with the band's evolution. The changes we've made in my opinion have been beneficial to the group. From top to bottom, the current lineup doesn't have a weak link. Every member has a specific role and it's important to have the right people in place. The band started in 2011 and it's no secret we've been through many members. Throughout our history we've had 13 people in the band, and without each and every person involved, we wouldn't be where we our today. It took us a while to find our niche. We started out as some sort of hybrid to blues music. We would get away from it here and there but for some reason, it would naturally pull back. Originally we called ourselves Mojo Walker. At that point, we were fronted by a male vocalist. We went to a format rarely seen after that - we had three girls front the band. That's when we changed the name again, calling ourselves Bittersweet & The B-Sides. In early 2014 Brandon James became our new vocalist. I thought The B-Sides had more of a feminine ring to it, so I decided to change the name again, and that's how Po'Boy Special came about. I wanted you to hear the name and know just by that alone we were a blues band. "The Po'Boy" is a staple at any blues club in Chicago, so do I think our name fits our current sound. Not only do I think it fits, I think it's perfect! Q - In sitting down to record "Barely Gettin' By," what were your goals and do you think you accomplished them? What would you like people to come away with the EP? Our primary goal for the E.P. isn't as much for the fan as it is for the industry. In fact, I don't even know if there's gonna to be a hard copy printed. The point of recording is to get yourself out there. We really needed new material to showcase what our band was about. I'm proud of everybody for the quality of work they put into it. We're really hoping to get our foot in the door in some of the city's premiere blues clubs. Chicago's tradition for blues music dates back to at least the '30s and is still holding strong today. There's a scene for the music we play and we want to be part of it. Q - What do you think of the Chicago music scene and how do you see Po'Boy Special fitting into it? Do you have any favorite places to play? We've been paying our dues for what seems to be forever, we've played all over Chicago and one thing I can say about our city is that there is so much talent. We've had the privilege of sharing the same stage with some very talented artists. Being a blues band, we get booked with every genre of music. It seems like we just fit in. We were fortunate to catch a few breaks this year. In July, we got to headline the House Of Blues, which is always a memory you never forget and we're looking forward to closing out the year at The Metro. But I gotta say a few places stand out on a smaller scale, be it sound, the room itself and most importantly hospitality. For that I'd like to take the time to thank The Cubby Bear, Beat Kitchen and The Double Door, all wonderful venues to play at. Q - Who or what are your main musical influences and how do you think they affect your music? I think everybody you've ever listened to has to some degree of influence on a musician, but when it come to Po'Boy Special, there's a few artists that have helped mold our sound. I'm sure I'm gonna leave some people out but it all starts with the great Muddy Waters and Willie Dixon. Another artist that is very important to us is Freddie King. He's probably had the most impact on us as a group, we honor him in the latest E.P. with a track called "Texas in Chicago." Mark and I wrote this as a studio track. It turned out to be one of my favorite tracks, this song screams Freddie King. Magic Sam is another influence, along with Luther Allison, Koko Taylor and let's not forget B.B.King. Q - What are the bands short-term and long-term goals? We're not reaching for the stars, we do this cause we enjoy playing music. Sure if we could make a living playing our instruments I think everyone would jump at that chance, but with the Internet and the way music is distributed nowadays, it makes everything much more challenging. We're hoping 2015 will be a good year for the band. We really would like to start meeting other bands that share the same interest in music as we do. As I said earlier, I think more than anything we would like to playing at the blues bars, Rosa's, Kingston Mines, Chicago Blues, and Legends, along with being involved in some family orientated environments such as festivals. And if we can get signed along the way, that would make for an even better year! For the third year in a row, Chicago-based group Diana & the Dishes will present the Woman Power Holiday Show, a night of female-fronted bands raising money for a nonprofit that supports women in Chicago. This year's show will benefit Global Girls, a dance, theatre and performance education organization for girls in Chicago's South Shore neighborhood. The show will be presented Dec. 22 at Schubas Tavern, 3159 N. Southport Ave., Chicago. The music starts at 8 p.m. and tickets are $15, available by going to http://www.lh-st.com/Shows/12-22-2014+Woman+Power+Holiday+Show. I had the chance to talk to show organizer and Diana & the Dishes frontwoman Diana Lawrence about the upcoming show. Q - Great talking to you again. This is the third year of the Woman Power Holiday Show. What made you want to start the event in the first place? Has it lived up to your expectations? I started the WPHS for many reasons...to feature fantastic local female talent, to raise awareness about the problems facing women in our city, to connect music-makers and music fans to the organizations that are fighting those problems. Each year, we've learned more about how to run the event successfully. Last year, despite a snow storm, we raised a good chunk of change for Deborah's Place, a local women's shelter, and the vibe in the room was incredibly warm and giving and fun. I've really come to look forward to putting on this show each year! Q - What should people expect from this year's show? How did you go about choosing the bands for this year's show? I'm really excited about the bands on this year's show. Since the organization we are benefiting is a theatre education organization, I decided to invite two bands onto the bill that are fronted by women who are active in Chicago's professional theatre community (as am I). Fantastic singing, fantastic songwriting/arrangements/musicianship, fantastic stage presence. These ladies know how to put on a show. Q - This year's show benefits Global Girls. How did you hear about the group and how do you determine each year what group to help? I found Global Girls just through word of mouth and Internet research. They have been wonderful, and are really partnering with us to make this show a success. Each year, I've tried to find a organization with a slightly different and but equally compelling mission... thus far, I've aimed for Chicago-based organizations (as opposed to national charities), and that's worked well. I like keeping it local. Q - How are things going with your own group, Diana & the Dishes? What can we expect from the group in the coming year? Things are going well with the Dishes! We were featured in an indie film this past fall (Teleporter Productions' "The View From Tall") which won't be coming out for some time, but which we're very excited about. In 2015, I'm hoping to keep building our local and regional presence, and ideally release a new record by the end of 2015. We have tons of new material we're working on, some of which we hope to reveal at this Schubas show. I so love the guys in my band... they're fantastic, thoughtful musicians (and hilariously fun people) and the more we work on material, the more I love 'em. Q - What do you think of the Chicago music scene and where do you see yourself fitting into the scene? Chicago's music scene is always bursting at the seams with more bands and shows than you could ever go see in a lifetime, and I love that. But I think it can be a tough nut to crack. I'm honestly not always sure where I and Diana & the Dishes fit into it. We pull from rock, pop, soul and blues, but also from folk, jazz, and cabaret, which I've found is kind of a rare breed of band in Chicago. 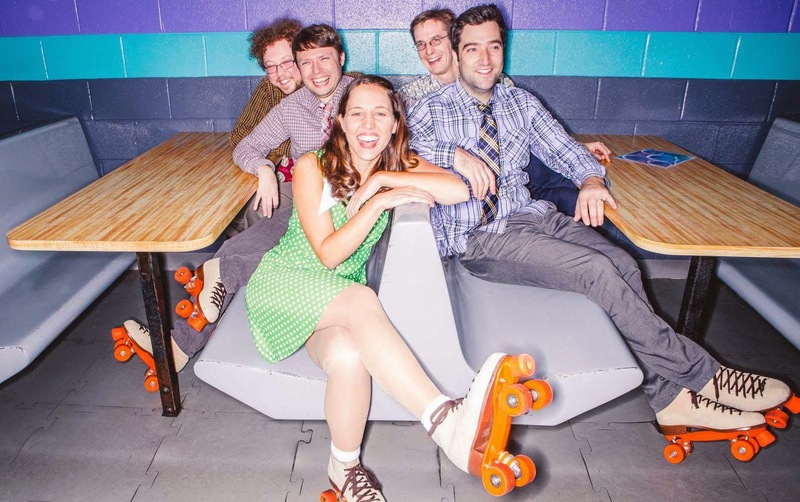 But (for better or worse) we've never really concerned ourselves with being "hip," and we certainly love what we're doing and where we're going in the Chicago music scene and beyond. Also, I've unfortunately found that being a female-fronted band can make things more of an uphill slog. But my goal is that the Woman Power Holiday Show will keep doing it's part to show that women in this city can(/should/will continue to) rock, and should continue to demand everyone's attention, at the holidays and at every other time of the year.